There are a variety of ways to build and install fire pits or planters. Materials very greatly and include natural stone, precast stone and poured concrete with stone veneer. Precast stone is typically the most cost effective material to use because it required less labour at the blocks are pre-cut and stack easily. Precast stone used to come in limited styles and colours but now there are many manufacturers who offer a vast array of styles and colours to choose from. Precast stone can be used to create fire pits and planters that have straight or curved lines in any configuration you can think of. If installed correctly, precast stone fire pits and planters will last for a very long time. Natural stone is a great choice for your fire pit or planter if you are looking to add a more earthy organic look to you backyard or front yard landscaping. You could also consider structures built with concrete and then add a natural stone veneer to the outside facing. 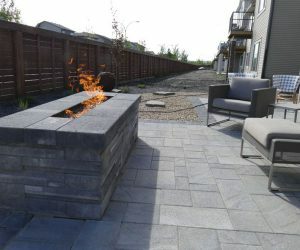 Concrete fire pits and planters can last for a very, very long time and they add a timeless beauty to your landscaping that is hard to duplicate with precast stone. The applications are endless and include retaining walls, planters, fire pits, outdoor kitchens, and benches. There are many natural stone styles and colours to choose from so you will always find a look that goes well with your home. If you have natural stone on your house then natural stone landscaping features are likely a great addition to your landscaping. The costs are slightly more for natural stone but the look is well worth it. Natural stone may or may not be a good fit for your landscaping so meeting with a landscape professional from Chinook Landscaping can help you decide whether the look is for you.